NASA's Kepler spacecraft hunting for Earth-like planets aroundother stars has found 706 candidates for potential alien worlds while gazing atmore than 156,000 stars packed into a single patch of the sky. If all 706 of these objects pass the stringent follow-up teststo determine if they are actually planets, and not false alarms, they could nearlytriple the current number of known extrasolar planets. They were announced aspart of a huge release of data from the mission's first 43 days by NASA's Kepler science team this week. The Keplerspace observatory monitors stars for subtle changes in their brightness,which could indicate the presence of alien planets passing in front of them asseen from Earth. Astronomers will use the newly-released data from Kepler todetermine if orbiting planets are responsible for the variation in brightnessof several hundred stars.
? "This is the most precise, nearly continuous, longestand largest data set of stellar photometry ever," said David Koch, themission's deputy principal investigator at NASA's Ames Research Center inMoffett Field, Calif., in a statement. "The results will only get betteras the duration of the data set grows with time." To date, astronomers have discovered more than 400 alienplanets lurking around stars beyond our solar system. That includes sixnewfound worlds discovered by a French observatory that were announced earlierthis week. Kepler currently monitors a star field in the constellationsCygnus and Lyra. The stars make up a full range of temperatures, sizes andages. Many of them are stable, but others pulsate. Some of the stars show starspots,which are similar to sunspots, and a few even produce flares that are sopowerful they would sterilize their nearest planets, should any exist. In this particular star field, Kepler has identified 706planetary candidates, of which the data for 306 of these were part of thepublic data release this week. 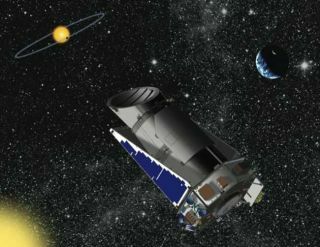 The 28 members of the Kepler science team are usingground-based telescopes, the Hubble Space Telescope and the Spitzer SpaceTelescope to perform follow-up observations on a specific set of 400 objects thatwere not publicly released to double-check if they are good candidates foralien planets. Data from these follow-up observations will determine whichof the objects of interest can be identified as planets. These findings willsubsequently be released to the scientific community in February 2011. Follow-up observations are necessary in order to distinguishcandidates that are actual planets from false alarms, such as binarystars, which are two stars that orbit each other. "For the most interesting objects, we go through aprocess of putting the data through a series of sieves," Charles Sobeck, Kepler'sdeputy project manager, told SPACE.com. "For final candidates that havepassed all the tests, we then go to the expensive resources like Hubble andSpitzer." The size of planetary candidates can also only beapproximated until the size of the stars they orbit is determined fromadditional spectroscopic observations made by ground-based telescopes. "I look forward to the scientific community analyzingthe data and announcing new exoplanet results in the coming months," saidLia LaPiana, Kepler's program executive at NASA Headquarters in Washington,D.C., in a statement. The Kepler observatory will continue conducting scienceoperations until at least November 2012. It will also continue searching for Earth-likeplanets, including those that orbit stars in a warm, habitable zone whereliquid water could exist on the surface of alien planets. ? And, since transits of planets within this habitable zone ofsolar-like stars occur about once a year and require three transits forverification, it is expected to take at least three years to locate and verifyany potential Earth-size planet. "The Kepler observations will tell us whether there aremany stars with planetsthat could harbor life, or whether we might be alone in our galaxy,"said Kepler's science principal investigator William Borucki of NASA's AmesResearch Center. So far, Kepler's observations have produced a wealth ofinformation, and it has surpassed the expectations of its mission scientists,Borucki said. "We never thought we'd have this much this early, it'sabsolutely wonderful," Borucki told SPACE.com. "The instruments areworking well, but we still have some work to do. We're certainly not finishedwith this kind of work, and each year, we go to more and more difficult targets.So, people have to be patient."